Shot entirely on location in the Mediterranean, this series accompanies Alwyn and his wife June on their painting holiday in Mallorca. From the bustling streets of Palma to the oldest orange grove on the island, from mountain villages to enchanting harbours. Alwyn and June visit the undiscovered parts of the island and share the delights of this beautiful and varied part of the Mediterranean. Each programme contains at least four paintings and drawings, giving the audience an inspiring introduction to painting on holiday and to a very picturesque part of the world. The mountain villages of Deia and Fornalutx provide the stunning locations for this programme. Subjects drawn and painted include an old monastery, a fountain and the cobbled streets and stone houses of Fornalutx. Shot in and around the oldest orange grove on the island, subjects include a meadow full of poppies, a panoramic view of the grove and the mountains behind, a gnarled olive tree and, of course, an orange. An electric railway runs between the beautiful market town of Soller and the capital, Palma. Alwyn and June take the train from Palma which winds up and eventually cuts through the mountains. Built in the 1920s, the station and the trains provide plenty of subjects for Alwyn and June to sketch and draw. 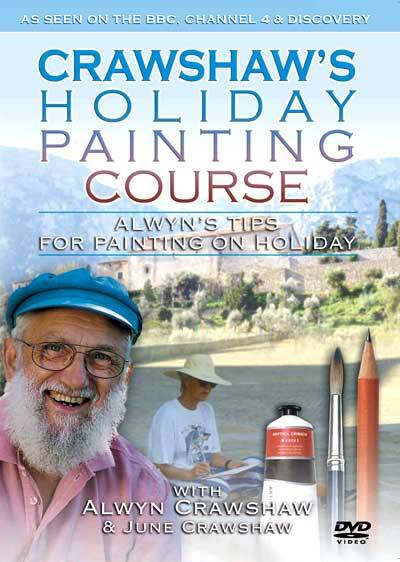 Sometimes on holiday it suits to work indoors and in this programme Alwyn shows how to use photographs and postcards as inspiration for paintings. Alwyn sketches a lighthouse in biro on the back of a postcard. The programme starts with a panoramic view of this beautiful old city, dominated by the massive cathedral, which Alwyn sketches in watercolour. Moving into the city itself, Alwyn and June take a tour in a pony and trap, visit the Arab baths and buy cakes from a famous shop next to the Opera House. Subjects include traditional fishing boats in Soller Port, a fisherman mending his nets and the cliffs at sunset. but not with some older United States Televisions, they must accept PAL format or be Multi-Format.